The nation’s electric and gas utilities are investing in infrastructure to upgrade aging transmission and distribution systems, build new natural gas, solar and wind generation and implement new technologies. We expect considerable levels of spending to serve as the basis for solid profit expansion for the foreseeable future. As of Nov. 6, S&P Global Market Intelligence consensus normalized EPS projections call for 6.4% growth in 2018 for the companies in the RRA utility universe, with 3.8% expansion forecast for 2019 and 6.3% for 2020. 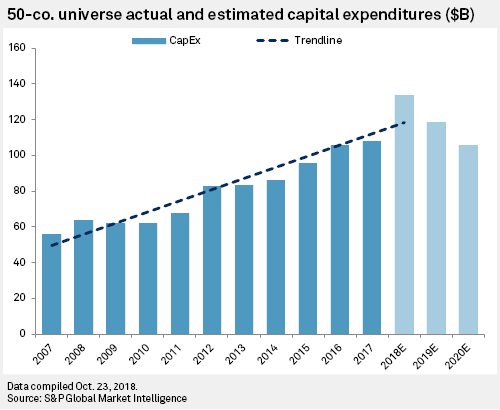 Although our data indicates that CapEx in the industry may fall in 2019 and 2020, our observations of recent years suggest that actual investment will likely continue to rise. Considerable motivations exist for spending to remain elevated, including pent-up demand to replace and modernize aging infrastructure. Sempra Energy's capital spending in 2018 and 2019 is projected to be about 28% higher than the company's forecast earlier this year, with the company’s disclosure in June of up to approximately $2.5 billion of off-balance sheet CapEx at Oncor Electric Delivery Co. LLC in Texas, which Sempra indirectly owns approximately an 80% stake. Key trends expected to drive capital investment opportunities at Oncor include new transmission infrastructure to accommodate utility-scale renewable energy growth in the Electric Reliability Council of Texas, or ERCOT, region; expected strong electric demand within ERCOT, particularly in the Permian Basin; and expected electric vehicle infrastructure growth in Oncor’s service territory. Sempra, in June, also disclosed up to $1.9 billion of off-balance sheet "project" CapEx. 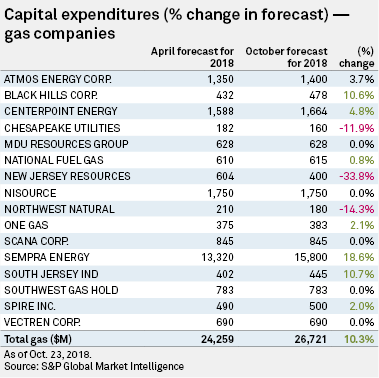 For 2018, planned CapEx is forecast to be nearly 19% higher than the spring 2018 forecast. Capital investments at Black Hills Corp. are projected to top $1 billion over the 2018-19 timeframe, 14.6% higher than the forecast in early 2018. Gas utility system safety, reliability and integrity spending is projected to account for the majority of Black Hills' CapEx, at about 58% of the company’s $2.33 billion investment forecast for 2018 through 2022. Approximately a third of that budget is dedicated to the company's electric utility businesses. While gas and electric utility investments are expected to be the primary driver of higher earnings growth in the coming years at Black Hills, the company is directing 7%, or $151 million, of its CapEx budget toward unregulated investments. Black Hills' power generation subsidiary was selected earlier this year to build a $71 million 60-MW wind project in Colorado, which will provide power to an affiliated utility under a 25-year power purchase agreement. For 2018, planned CapEx is forecast to be approximately 6% higher than the spring 2018 forecast. Public Service Enterprise Group Inc.'s projected capital spending for the 2018-19 period is nearly 16% higher than our spring 2018 forecast, with the company's Public Service Electric and Gas Co., or PSE&G, utility planning between $12 billion to $16 billion of grid modernization, reliability and clean energy investments. The utility recently proposed a comprehensive Clean Energy Future plan that includes programs to expand energy efficiency in its New Jersey service territory, support electric vehicle adoption, explore energy storage applications and enable "smart energy capabilities" that will improve reliability through an "Energy Cloud" initiative. The programs are intended to align with Gov. Phil Murphy’s energy policy goals and related legislation enacted earlier this year. PSE&G estimates the cost of the multiyear program at $4.1 billion. In June, PSE&G requested regulatory approval for an extension and expansion of its Energy Strong infrastructure investment initiative, which was initially approved in 2014. The latest plan, Energy Strong II, calls for $1.5 billion to be invested in electric infrastructure, including substation upgrades and replacements, circuit upgrades and advanced distribution, and $1 billion for gas distribution reliability and modernization work. Planned CapEx in calendar 2018 is forecast to be approximately 11% higher than our spring 2018 forecast. NextEra Energy Inc. is projected to spend nearly $32 billion between 2018 and 2020 as the company looks to grow EPS 6% to 8% annually over the long term, along with 12% to 14% annual dividend per share growth through at least 2020. 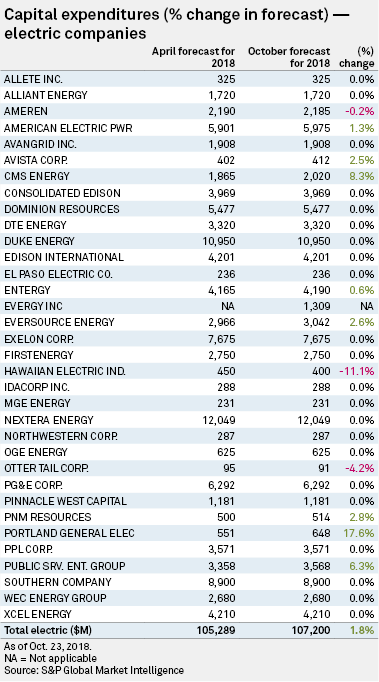 At the utility Florida Power & Light Co., regulated investments were the primary driver of NextEra's EPS growth in the third quarter. Looking ahead, transmission, distribution, generation and solar investments are expected to lay the ground for future rate base and earnings growth. Renewable energy development projects, including those at NextEra's competitive arm NextEra Energy Resources, or NEER, could potentially account for approximately half of NextEra’s planned CapEx between 2018 and 2020. NEER continues to advance its wind, solar and wind repowering development pipeline, with the addition of approximately 2,100 MW of renewables and repower projects to the company's development backlog. As of Oct. 23, the company expects to sign contracts to develop between 10.1 GW and 16.5 GW of such projects between 2017 and 2020, with nearly 10.7 GW of contracts already signed for development between 2017 and 2020. Duke Energy Corp.'s approximately $31 billion CapEx budget between 2018 and 2020 will see spending weighted toward electric and gas utility investments and electric generation and transmission projects. In early September, Duke Energy Carolinas LLC and Duke Energy Progress LLC filed their integrated resource plans with the North Carolina Utilities Commission, calling for the retirement of coal-fired generation and the addition of new gas-fired generation, renewable energy and battery storage. Looking ahead, between 2018 and 2022, Duke plans to direct nearly $30 billion of growth capital toward electric utilities and infrastructure, $6.7 billion to gas utilities and infrastructure and $1.5 billion toward commercial renewables. 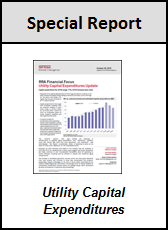 See the full utility capital expenditure report published Oct. 30 here. For a full listing of past and pending rate cases, rate case statistics and upcoming events, visit the S&P Global Market Intelligence Energy Research Home Page. For a complete, searchable listing of RRA's in-depth research and analysis, please go to the S&P Global Market Intelligence Energy Research Library.